Marrow, Helen B. 2017. On the Line: Latino Life in New Immigrant Destinations after 2005On the Line: Slaughterhouse Lives and the Making of the New South, by RibasVanesa. Oakland: University of California Press, 2016. 272 pp. $29.95 paper. ISBN: 9780520282964.. Contemporary Sociology: A Journal of Reviews, Vol. 46, Issue. 3, p. 265. Abrajano, Marisa A., and Michael Alvarez, R.. 2010. New Faces, New Voices: The Hispanic Electorate in America. Princeton, NJ: Princeton University Press. Bingham, Natasha, and Wilkinson, Betina Cutaia. 2010. “The Aftermath of a Hurricane: African American Responses to Latino Immigration in the Greater New Orleans Area.” Unpublished manuscript. Blumer, Herbert. 1958. “Race Prejudice as a Sense of Group Position.” Pacific Sociological Review 1: 3– 7. Bobo, Lawrence, and Hutchings, Vincent L.. 1996. “Perceptions of Racial Group Competition: Extending Blumer’s Theory of Group Position to a Multiracial Social Context.” American Sociological Review 61: 951–72. Citrin, Jack, Green, Donald P., Muste, Christopher, and Wong, Cara. 1997. “Public Opinion toward Immigration Reform: The Role of Economic Motivations.” The Journal of Politics 59 (3): 858– 81. Diamond, Jeff. 1998. “African-American Attitudes towards United States Immigration Policy.” International Migration Review 32 (2): 451–70. Espenshade, Thomas J., and Hempstead, Katherine. 1996. “Contemporary American Attitudes toward U.S. Immigration.” International Migration Review 30 (2): 535–70. Fraga, Luis R., Garcia, John A., Hero, Rodney, Jones-Correa, Michael, Martinez-Ebers, Valerie, and Segura, Gary M.. 2010. Latino Lives in America: Making it Home. Philadelphia: Temple University Press. Gay, Claudine. 2006. “Seeing Difference: The Effect of Economic Disparity on Black Attitudes toward Latinos.” American Journal of Political Science 50 (4): 982–97. Hopkins, Dan. 2010. “Politicized Places: Explaining Where and When Immigrants Provoke Local Opposition.” American Political Science Review 104 (1): 40–60. Hutchings, Vincent L., Wong, Cara, Jackson, James, and Brown, Ronald E.. 2011. “Explaining Perceptions of Competitive Threat in a Multiracial Context.” In Race, Reform and Regulation of the Electoral Process: Recurring Puzzles in American Democracy, ed. Charles, Guy-Uriel E., Gerken, Heather K., and Kang, Michael S., 52–74. Cambridge: Cambridge University Press. Key, V. O. 1949. Southern Politics in State and Nation. Knoxville: University of Tennessee Press. Kochhar, Rakesh, Suro, Robert, and Tafoya, Sonya. 2005. “The New Latino South: The Context and Consequences of Rapid Population Growth. ” Pew Hispanic Center: A Pew Research Center Project. Available at www.pewhispanic.org. McClain, Paula D., Lyle, Monique L., Carter, Niambi M., DeFrancesco Soto, Victoria M., Lackey, Gerald F., Davenport Cotton, Kendra, et al. 2007. “Black Americans and Latino Immigrants in a Southern City: Friendly Neighbors or Economic Competitors?” Du Bois Review 4 (1): 97– 117. McDermott, Monica. 2011. 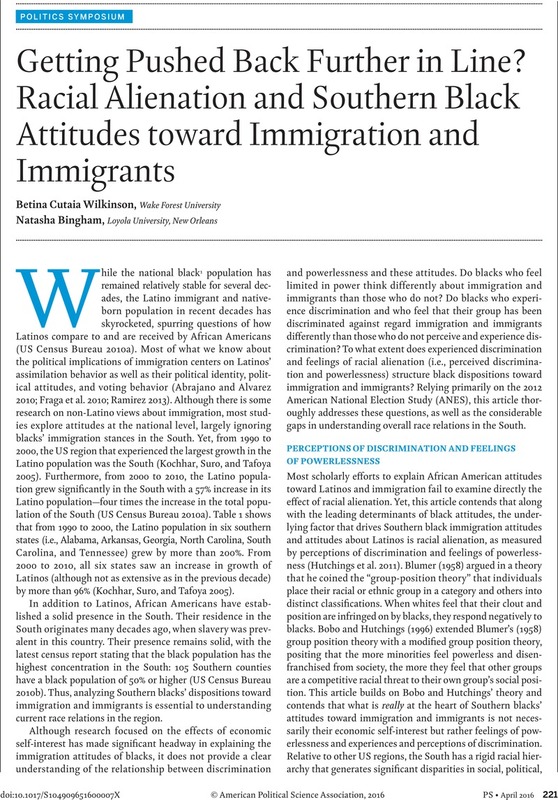 “Black Attitudes towards Hispanic Immigrants in South Carolina.” In Just Neighbors? Research on African American and Latino Relations in the United States, ed. Telles, Edward, Sawyer, Mark Q., and Rivera-Salgado, Gaspar, 242–66. New York: Russell Sage Foundation. Nteta, Tatishe. 2013. “United We Stand? African Americans, Self-Interest, and Immigration Reform.” American Politics Research 41 (1): 147–72. Ramirez, Ricardo. 2013. Mobilizing Opportunities: The Evolving Latino Electorate and the Future of American Politics. Charlottesville: University of Virginia Press. Sanchez, Gabriel R. 2008. “Latino Group Consciousness and Perceptions of Commonality with African Americans.” Social Science Quarterly 89 (2): 428–44. US Census Bureau. 2010a. “Hispanic Origin Publications.” Available at www.census.gov/population/hispanic/publications. US Census Bureau. 2010b. “2010 Census Data.” Available at www.census.gov/2010census/data.